expressive art in my psychotherapy private practice. Kymberlee Stanley was born and raised in Southern California, and comes from a family of three generations raised near the California coast. Her first exposure to oil painting was a summer painting class her mother enrolled her in at the age of 18 at the local hardware store. She later received an art scholarship to attend Biola University, near Los Angeles, partially granted to her from one painting she painted in the hardware store class. Although Kymberlee attended as a full-time art major her freshman year, she later changed to a public university the following year at her family’s request. She graduated from CSULB with a degree in Liberal Arts and an art concentration, and began her career as an elementary teacher working with at risk students in Southern California. Ten years later, she went to USC in Los Angeles to become a licensed clinical social worker and therapist, and then continued her counseling career working in schools in the San Francisco Bay Area. Since 2015, Kymberlee and her husband built a large art studio in their backyard to provide an outlet for her painting on a full-time basis, to facilitate expressive art groups and to continue using art therapy in her psychotherapy private practice. She has shown her work at University School of Nashville’s Tibbott Gallery, Forest and Ocean Gallery of Laguna Beach, Montgomery Bell Academy Show, Crystal Cove Conservancy Invitational, Daily Paintbrush Online Gallery, and The Chestnut Group’s Plein Air Shows. Since she began painting again, Kymberlee has taken over 15 plein-air and studio oil painting workshops with artists such as Lori Putnam, Dawn Whitelaw, Ray Roberts, Ann Blair Brown. She works regularly with oil painting mentors such as Marcie Hicks and S.A. Habib for feedback and regular studio critiques. 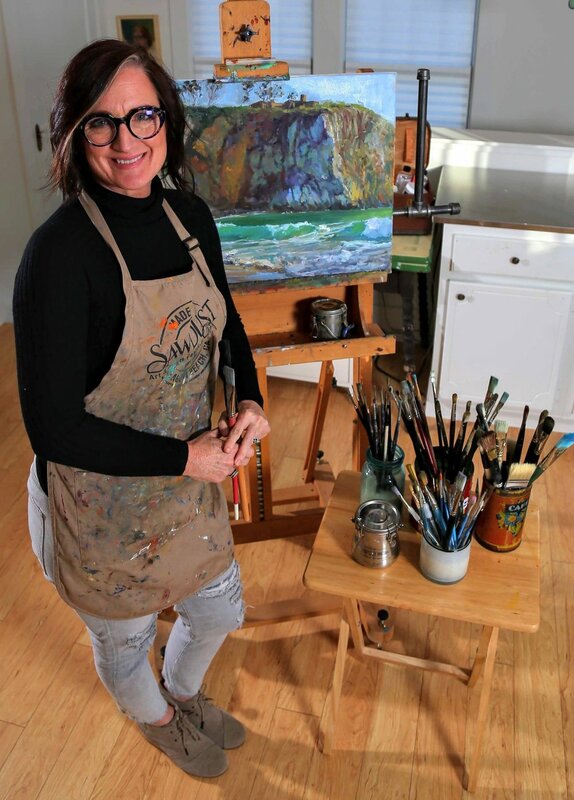 For the last 30 years she has been visiting Laguna Beach (where she lived for 6 years) and Catalina Island (where she used to work) to paint on the beach and to reconnects with her friends, family, and other California Impressionists. She is always inspired by the Festival of the Arts and the Sawdust Festival in Laguna where she hopes to show someday. In the Spring of 2018 she took a dream trip to paint in Provence and Paris, France and was inspired by the light, color, and the visiting Cezanne’s atelier studio. In the summer of 2018 she painted alongside Michael Obermeyer and Wendy Wirth at Laguna Plein Air Painters Association (LPAPA) and with Southern California Plein Air painter events on the beach in Laguna and in the Newport Back Bay. Her goal is to continue improving her technique through mentorships, collaboration, continuing painting classes, and building a network with other patrons, sellers and collectors. Please contact me if you would like to know more. I would love to meet you! In 2015, Kymberlee and her husband built “Studio K” in the backyard of their home. She has taught beginning oil painting classes through word of mouth and through Little Art House Nashville. She considers her studio her home away from home…and a place of rest for the weary soul. I have a large area where I run groups and private lessons, and an area where I see clients for therapy. I also paint daily on my easel. She also travels to senior facilities to host private lessons as well. In addition to her art, she continues working part-time as a psychotherapist with women, children and adolescents. She has been a licensed clinical social worker in California and Tennessee for the last 15 years, and a former teacher for 10 years. Among other therapeutic modalities, she enjoys using expressive arts in her practice and also facilitates expressive arts groups with other therapists. She hopes her work with expressive arts and creative discovery will encourage others to find “What gifts that have been undiscovered?” in themselves, and to rediscover new parts of their souls.